TORONTO (AP) New talent helped the Toronto Raptors, though a familiar face pushed them over the finish line. 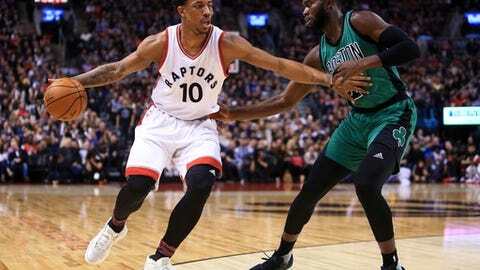 Fresh off starting in last weekend’s All-Star Game, and with Kyle Lowry out with a right wrist injury, DeMar DeRozan scored a career-high 43 points to lead Toronto back from a 17-point deficit to a 107-97 victory over the Boston Celtics on Friday night. The absence of his fellow All-Star brought on a change in mindset for DeRozan, who shot 15 of 28 from the floor in surpassing the 42 points he had against Houston on March 30, 2015. The debuts of the newly acquired Serge Ibaka and P.J. Tucker, who combined for 17 rebounds and contributed 15 and nine points, respectively, certainly helped make up for Lowry’s absence. Tucker was operating on little sleep after flying through the night following his trade from the Phoenix Suns on Thursday and wasn’t planning on playing. But once he arrived in Toronto, he quickly changed his mind. The arrival of Tucker and Ibaka, who came over in a trade from Orlando last week, was welcomed by the rest of the team, mainly due to the attributes the two bring, allowing others to focus on generating offense. The Celtics realized they need a better plan against DeRozan, who also had 41 points in his last game against them, on Jan. 10. Isaiah Thomas scored 20 points for the Celtics, while Crowder added 19 and Marcus Smart had 19 off the bench. Thomas had just four points in the fourth quarter and said the Raptors simply wanted the win more. Celtics: G Avery Bradley (right Achilles) sat out and coach Brad Stevens said G Gerald Green (left heel) would miss both Friday and Sunday’s games. … Thomas extended his franchise record of consecutive 20-point games to 42. Raptors: Cory Joseph replaced Lowry in the starting lineup. The addition of Ibaka (Republic of Congo) means the Raptors now have seven players on their roster born outside of the United States, tied with Utah for the most in the NBA. Ibaka quickly made himself at home on Friday, blocking Thomas’ shot inside of three minutes, before following that up with his first points as a Raptor on a jump shot seconds later, bringing an enthusiastic Air Canada Centre crowd to its feet. While Raptors coach Dwane Casey patrolled one sideline, his Toronto Maple Leafs counterpart, Mike Babcock, took in the game from the opposing sideline, sitting courtside alongside Toronto’s chief of police. With the Leafs currently on a three-game homestand, the Stanley Cup-winning coach was able to enjoy an evening off before his team hosts the rival Montreal Canadiens on Saturday night. Celtics: Visit Detroit on Sunday aiming for a third consecutive win at the Palace of Auburn Hills. Raptors: Host Portland on Sunday looking for a fourth straight win over the Trail Blazers.